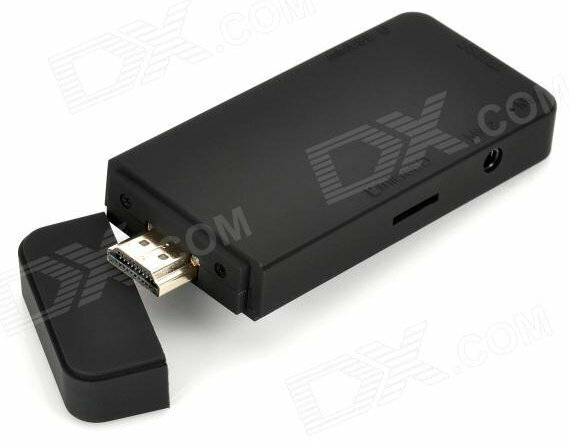 Last July, I reviewed Smallart U-Host (U1A), an Android TV stick based on AllWinner A10 with 1GB RAM and 4GB RAM. At the time, I had a positive opinion of the device as the Android firmware was stable, and mostly did it was supposed, and it was feasible to run Linux distributions on the device. At that time, it was sold for $70, but this morning, Clint, one of my reader, informed me he spotted an AllWinner A10 device selling for $20.50 on Dealextreme. The device is sold with a power adapter, a 8cm HDMI cable (8cm), a USB cable (80cm) and an English user manual, exactly the same accessories I received with Smallart U-Host (aka Oval Elephant). The $20 price tag is either a mistake, or the device does not sell that well and they want to get rid of existing stock.